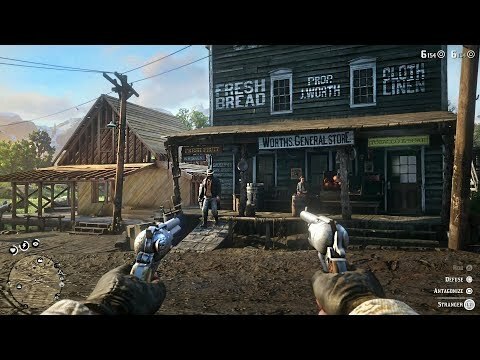 Red Dead Redemption II anyone? I like how they expanded on the realism aspect of the gameplay. Rockstar really nailed it with RDR2. Yep, I bought it. Have only played for about 90 mins but it seems like it's going to be great. My 16 year old son has it. Graphics are amazing. Looks like a western theme. In will sit down and watch him play Sunday . He is pretty darn good at the games. Looks super cool ...the only gaming I am doing these days in SKYRIM in VR! and I don't have much time for that! THere is nothing like watching a giant walk by you looking like its 9 feet tall! Is this a video game? Yes, this will give you an idea how good the graphics are, when playing through is normally it’s like being in a movie.. I picked it up on Friday and played for about 20 minutes last night. I was tired, so I didn't put any real time into it, but I look forward to it. For me I had to get out of the first chapter until I got interested. Seriously the nuances of realism are mindblowing. Water actually looks real. This is giving God of War a run for game of the year. With online coming up soon if anyone wants to make a posse I’m on ps4 name is talltizzle. See you out in the wild partner. I couldn't get into the game after two hours in the snow, so I ended up selling it. I read that it picks up a lot afterward, so I may give it another shot in the future. Now that I have a PS4 (as of last week), I've started building a small library of the exclusives I've wanted to play, including Spider-Man, the Uncharted series, and MLB The Show. Get God of War like yesterday. Yes it is slow during the snow part but it is a tutorial portion after all. I wasn't able to get into RDR2 until after that point. Can't blame ya though. Seriously though...God of War is my game of the year. Also get PSN because they usually give 2 free games a month. Some better than others. I have amassed 140 free games over the last couple years and some I was willing to pay for. On top of that the sales get crazy cheap. I bought Battle Field 1 for $5, Dark souls 3 for $8, Dark souls 2 for $3 and the list goes on. Usually new games will drop to under 40 within 6 months on PSN. I loved the original God of War games on the PS2. They were fantastic! I used to subscribe to Xbox Live Gold when it would go on sale, but I don’t play online anymore. The free games were nice when they were good/decent, but it’s not worth the cost (for me) for the most part. I don’t plan on playing online on the PS4, but I’ve seen how the sales can be nice. I picked up The Last of Us Remastered on sale and the Spider-Man DLC pack for 20% off with my PSN code from the bundle. Does anyone have a copy of Uncharted 4 they’d consider selling for cheap? I picked up a copy today. Thanks.